Tom couldn’t believe it when he was told Elvis and his wife Priscilla had been seen in the foyer of the Flamingo. He thought it was a wind-up but it was true – The King and his entourage, the ‘Memphis Mafia’, had driven from Los Angeles just to see the show. They had been invited by Chris Hutchins, who knew both Colonel Tom Parker and Joe Esposito, Elvis’s road manager, and suggested they come over. Elvis was curious to see how a performer like Tom would be received in Las Vegas, because he was seriously thinking of making a live comeback there himself. His recording career was in the middle of a slump and he needed something to reinvigorate his career – a problem Tom would also face at a later date. The lighting in the audience was quite dark, so Tom had to peer into the gloom to see if Elvis was really there. He had been primed by Chris, so he knew what to say if he caught sight of the man. Eventually, he realised The King was in the very front row. Halfway through the show, he introduced Elvis, who stood up to take a bow, and the place erupted. It went on for ages and ages, until Tom managed to calm everyone down. Elvis eventually sat back down and Tom said, ‘Don’t forget I’m the star here tonight.’ It was a tongue-in-cheek comment, but took some nerve: Tom was just starting his Vegas adventure, whereas Elvis was the biggest star in the world. After the concert, Elvis and his gang went backstage to congratulate Tom in his dressing room. The ‘Mafia’ usually numbered about half a dozen or so of Elvis’s oldest friends and yes-men. If Elvis told them at breakfast that scarlet was the new colour, they would all have their cars resprayed by lunch. Linda was at the Flamingo that evening and she sat and chatted with Priscilla. Tom remembers Elvis saying he wanted to watch him in concert to see how he put together his act. Tom and Elvis talked about music, something they both never tired of doing. Priscilla Presley believes that Elvis took to Tom because he was a real person – ‘someone who was down to earth that you could talk to, that was not on an ego trip’. Tom’s show also reminded Elvis how it used to be for him: the adulation of the girls, the applause and the fantastic music. He missed it. He also liked the way Tom didn’t take it too seriously. For his part,Tom thought the Presleys were ‘a great couple’. He gave Priscilla an autographed photograph for their daughter Lisa-Marie, who was six months old. Tom moved briefly to the International too, because its show- room was three times the size of the Flamingo’s. In 1971, he finally settled at Caesars Palace. Elvis, meanwhile, stayed loyal to the Hilton, where he lived in the impressive penthouse, which became known as ‘Party Central’. The two friends would take it in turns to visit each other’s suites. Elvis was a reality check for Tom – a stark example of a road he would go down if he didn’t look after himself. Tom tried to keep in shape. At home in the UK, it was relatively easy, thanks to his fitness complex. On the road or in Vegas, it was more difficult, but he swam and took up squash. In the eighteen months before he opened at the Flamingo, he slimmed down from fifteen to eleven and a half stone. He said goodbye to chips for ever. He never stuffed himself with burgers or other junk food and avoided puddings, preferring a chateaubriand steak for dinner with the finest wines. Tom didn’t drink before a concert, which was particularly important where the desert air was so dry and put a strain on his voice. His shows were a workout in themselves, because Tom finished dripping with sweat and as much as six pounds lighter. After a show, he took a long, thirty-minute shower and then enjoyed a vodka martini or opened a bottle or two of Dom Pérignon while he socialised. His friend and backing singer Darlene Love became so sick of the constant supply of vintage champagne that she loathes bubbly to this day and only has a glass if it is mixed with orange juice. Elvis, however, struggled with his weight yo-yoing up and down. Early on, he told Tom that he took pills to stop the pounds piling on. The two men would have many discussions about the merits of drink and drugs. During one conversation, Elvis told him that he had taken every kind of drug imaginable just to keep his ‘head together’. Elvis asked him what he took to keep sane and Tom replied simply, ‘Nothing, that’s why I feel I am sane.’ Tom’s aversion to drugs is very well known. He told Sylvie Simmons of MOJO magazine a funny story of the evening he went to a party in London thrown by Lulu. A rock star sidled up to him and said, ‘You want to see what’s going on in the kitchen!’ Tom, being Tom, immediately thought it might be something involving one or hopefully two women. He was disappointed to see that the great excitement was a pile of white powder on the kitchen table.‘See you later,’ he said. Elvis never took any drugs in front of Tom – he had too much respect for him. Instead, they would be sitting down, listening to records, when Elvis would suddenly disappear into the bedroom and come out a new man. They would listen to a few more records and then the same thing would happen again. They may have had differing opinions on drugs, but both Elvis and Tom had similar views on gambling. Although they were the bait to draw thousands of punters into the hotel casinos, they never indulged themselves. That example was not followed by their respective managers, who lost fortunes at the gaming tables. Gordon incurred heavy losses playing blackjack. He was rumoured, in one disastrous night, to have lost the whole of Engelbert’s fee for a year. Tom was intrinsically more sociable than Elvis, who preferred quiet evenings in his suite. He loved gospel music and was prepared to stay up even later than Tom, just singing. Tom would say goodnight and be halfway out the door, when Elvis would start something else and Tom would be obliged to go back in and sing another song. For the most part, they kept their friendship low-key. Elvis would slip into Caesars Palace with a baseball cap over his distinctive black hair and sit at the back of the room. Disappointingly, Elvis and Tom never sang together in public. Elvis might walk on stage when Tom was performing, but he was under strict contract to another hotel, so he would never join in with a quick chorus of ‘Delilah’. Their duets were private moments and Elvis made it clear that they must never be recorded. His manager, Colonel Parker, had told him that he must ensure there were no bootleg recordings, an instruction he followed religiously. Tom was the same where Gordon was concerned: he never forgot what Gordon said. The pair were such good friends, they exchanged rings. Elvis gave Tom a splendid black sapphire ring, which annoyingly disappeared from his hotel bathroom one night on tour – along with the young lady who was using it. 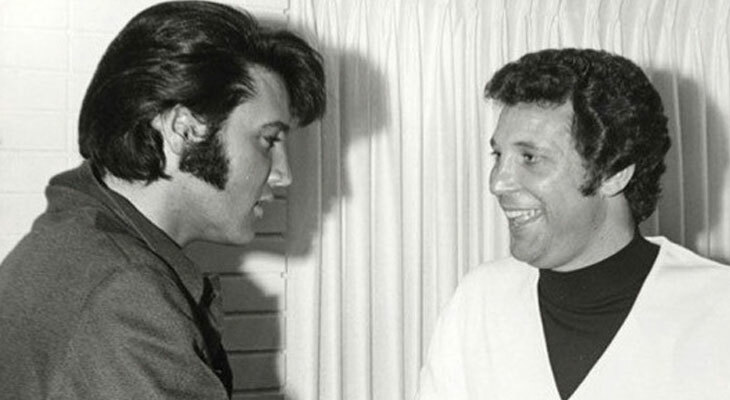 Tom, in turn, presented Elvis with a tiger’s eye ring that he knew he liked. Elvis, for whom death threats were a way of life, was obsessed with firearms and would make sure he was armed even when he used the toilet. He gave Tom a gun with ‘Tom Jones’ engraved on the barrel. Tom has never had to fire his gun, although he made sure he knew how to use it. Perversely, Elvis also gave him a book that he’d enjoyed, entitled The Impersonal Life, a famous text about self-discovery and leading a spiritual life.